Day 2 of the course dawned beautifully bright and sunny but breezy. After breakfast we assembled in the lower car park at PyB along with Steve who was joining us again but we had acquired a new instructor, Adam, as Dave had been taken sick overnight and wasn’t up to the day. The whole breezy thing was a little too extreme for going out on open sea but we headed off to Treaddur Bay on the South West corner of Anglesey. The photos in the gallery below show how lovely the weather appears but don’t really show the wind, which was blowing straight into the bay. The give away indicator is that I managed to take hardly any shots from the water except for a couple of shots from behind the rocks you can see on the satellite image above. 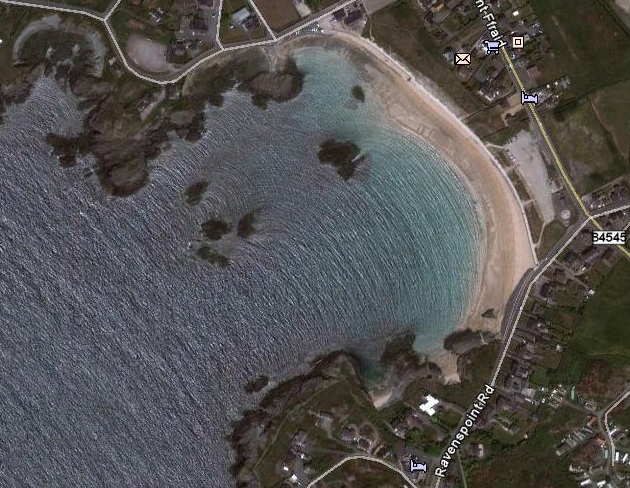 You’ve got to love Google Earth! The morning was spent practicing up wind and downwind turns in surf. This was interesting as it’s slightly counter intuitive to paddle backwards and complete what is effectively a three-point turn. We took our lunch on the small rock outcrop on the beach and then set off again. The afternoon session mainly consisted of more work with the waves followed by a very enjoyable surf session. I tried to get a couple of videos of the surfing with limited success as you can see below. Looking back on these videos even a short time later it’s amazing how small the waves look compared to how they felt at the time. Everything looks bigger when you’re actually on the water and when you’re as inexperienced as I am. On reflection all my estimates of conditions should be taken with a large pinch of salt. Altogether it was a very enjoyable day and we returned to PyB in high spirits. Perhaps the good mood was why I agreed to do a pool session that evening. In retrospect that was a mistake as I was knackered the next day but at the time it seemed like a good idea. It was certainly fun 🙂 Some of the group wanted to get confidence with capsizing and the rest of us were practicing rescues.